It has been incredibly lovely outside in Lancaster! On Tuesday I walked home from work without a coat and I decided it was time to clean out the grill and make something smokey. I had chicken legs and thighs in the refrigerator that I had planned to bake in the oven, but I decided to prepare them for grilling as soon as I got home. I would normally marinate them overnight but I only had an hour and I really wanted to be outside using the grill. I cleaned up my 6 bone-in, skin-on chicken legs and thighs, rubbed them with salt and pepper and placed them in a zip-top bag with 1/4 cup of Garlic Expressions vinaigrette and 1/4 cup of olive oil. While the chicken was marinating, I cleaned up the grill and got my charcoal heated up. I like to use a charcoal grill so much that I got rid of my propane gas grill when we moved a few years ago. I have a simple Weber One-Touch and some of their accessories. A lot of people think it is too much work to get the coals lit and ready, but if you get one of these contraptions it makes your charcoal heat up pretty quickly. It’s called a chimney starter. You stuff the bottom with a piece of newspaper (or fire starters) and light it. The cylinder shape shoots the flames up into the coals like…yes… a chimney! I’ll share my secret for getting the coals to light even faster: Twist up a piece of newspaper so it looks like a wick to a candle. Place the wick in the center of the starter standing up and surround it with your coals… like the wick of a candle. You can light the newspaper on the bottom and the top and your coals will catch fire even quicker… if you are really the impatient type. 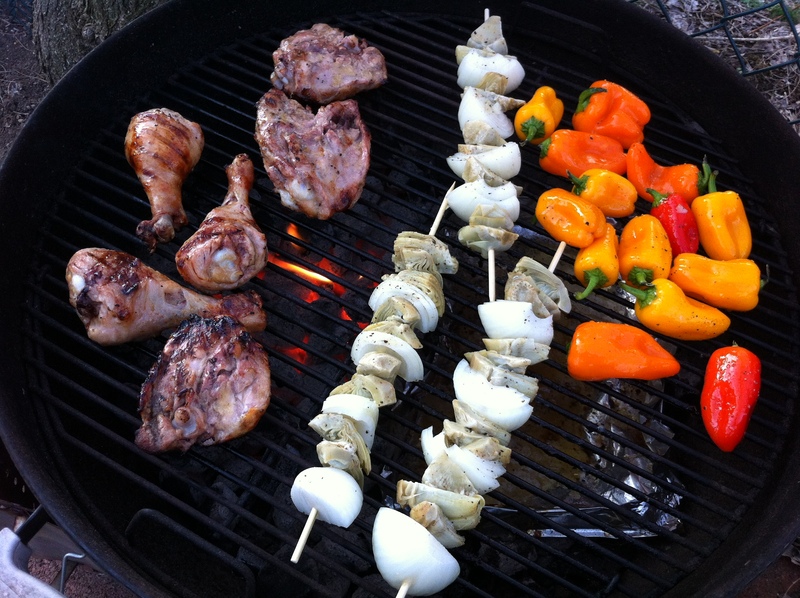 While the chicken is marinating and you have the grill coals heating up… get your veggies ready! I am using a medium size sweet spanish onion cut into large chunks, a box of frozen artichoke hearts (thawed), and about a pound of mini sweet peppers. 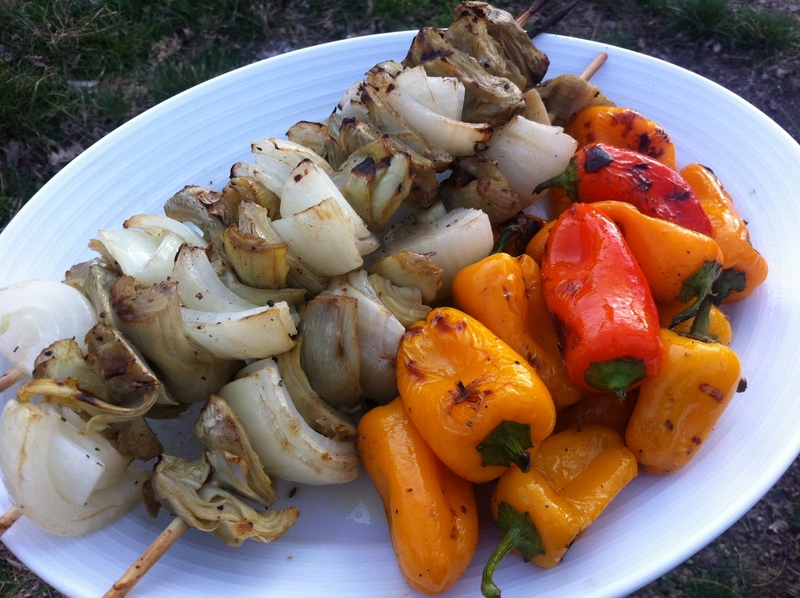 The peppers can go right on the grill, they are large enough that they won’t fall through the grates but I put the onions and artichokes on bamboo skewers so they won’t get lots through the grates. Drizzle all of your veggies with the same garlic vinaigrette as we marinated the chicken with and olive oil and sprinkle with salt and pepper. Ready to grill! I have spent a lot of time perfecting the way I cook chicken. Chicken is such a staple… it’s cheap, it’s readily available, and if it s cooked bad, it’s can make your dinner a disaster… if it’s cooked good, it can make you a star chef! 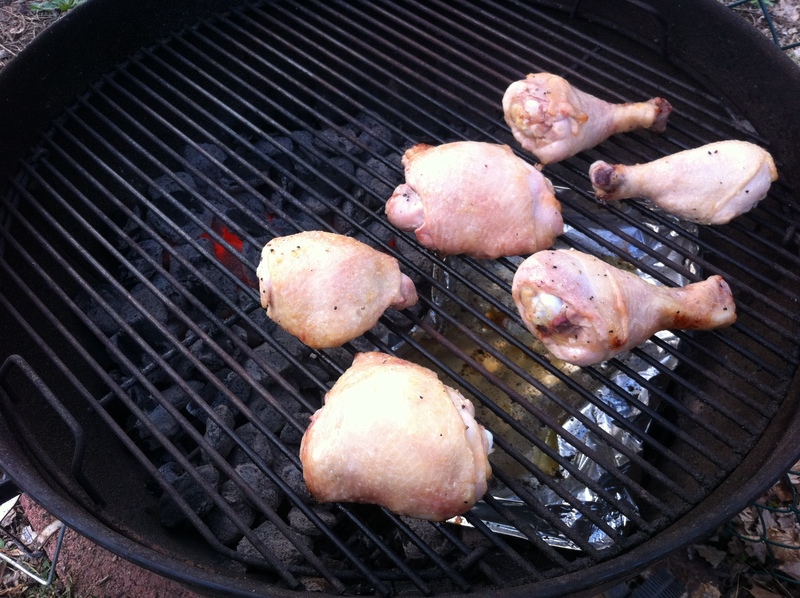 Here’s how I set up the grill to get juicy, perfectly grilled chicken. It takes a little longer but it is so worth it. Replace the upper grill grate and put the lid on the grill with the vents open. Allow the grill to heat up for a few minutes. Then remove the lid so that you can clean the upper grate. I like to use a triangular wire grill brush. It easily scrapes away anything on your grate. Make sure you heat up the grill grate before scraping, it makes it a lot easier to clean. 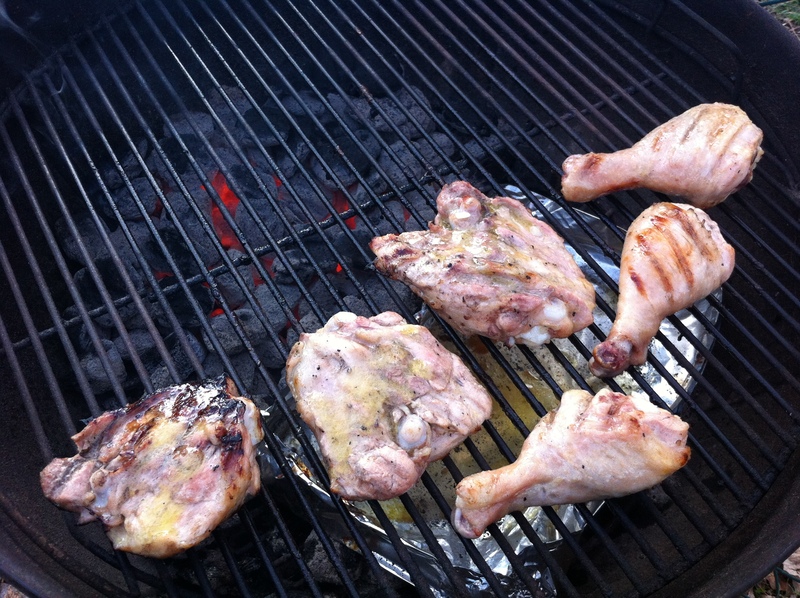 Flip the chicken over (skin side down now) and brush some of the marinade onto the pieces. Look at the grill marks that are starting to form! 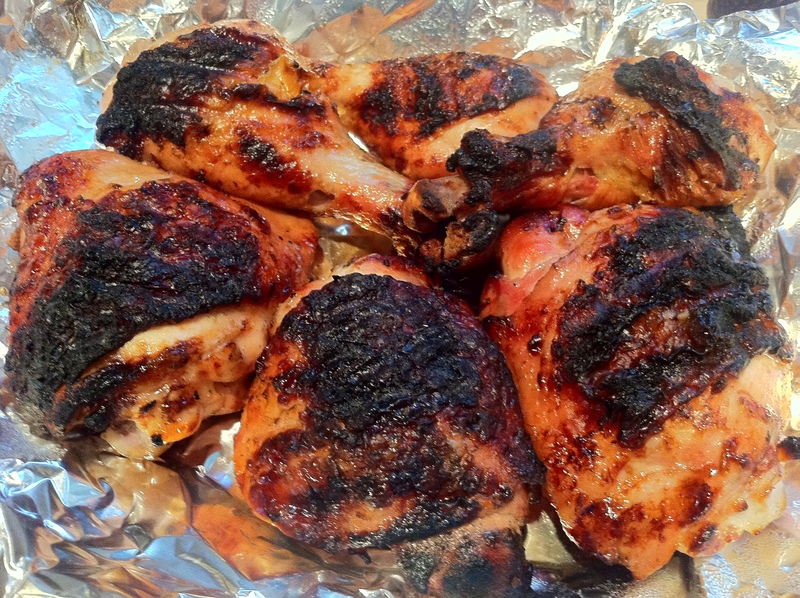 Cover the grill again and allow the chicken to cook for another 20 minutes. 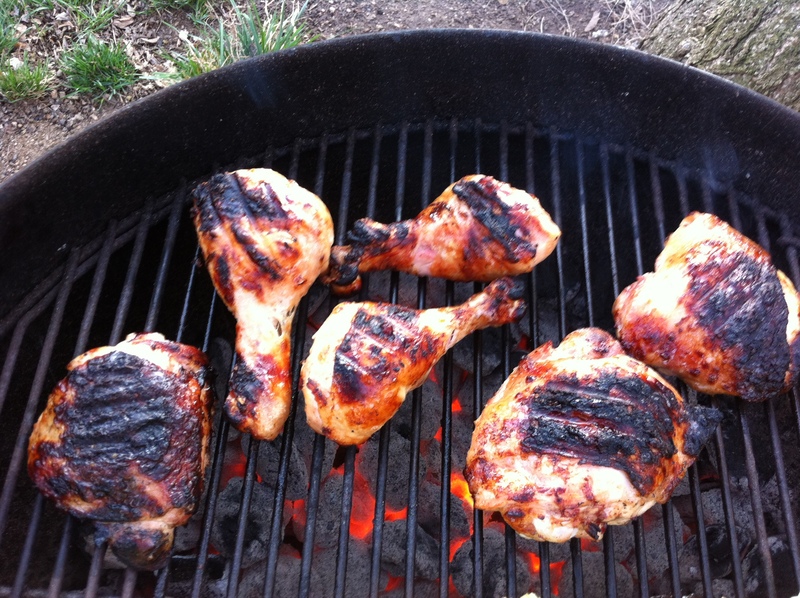 Use a thermometer to check the temperature of your chicken, the thermometer should read 160-165 degrees F. Flip the chicken over (skin side up) onto the other side of the grill (right over the hot coals). Only leave the chicken there for a few minutes and repeat on the other side. This will crisp up the skin but be sure to watch it because it will burn quickly! 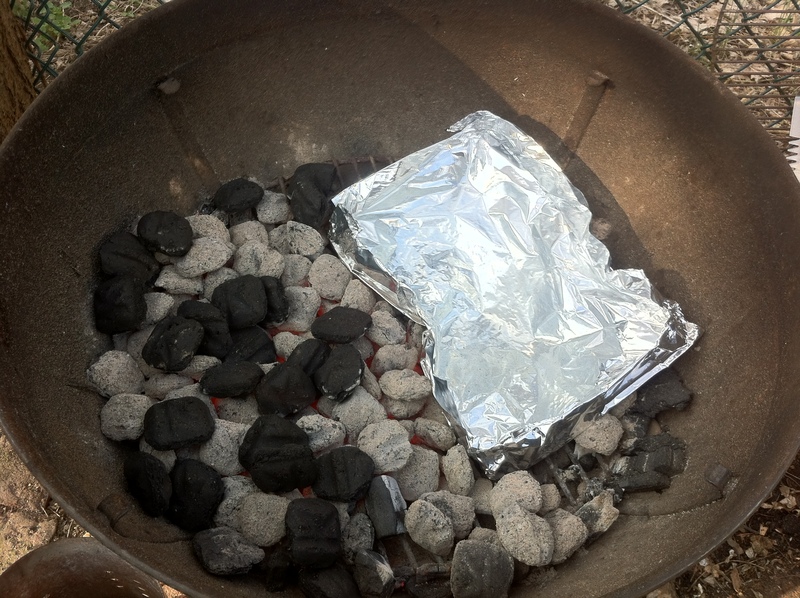 Remove the chicken and place it onto a piece of aluminum foil. 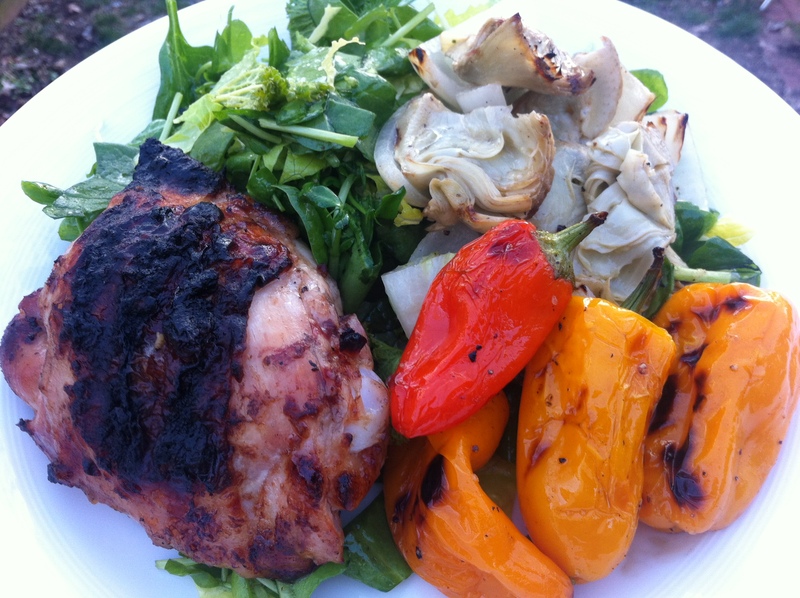 Wrap the chicken and let it rest until you have grilled your veggies. You can start the veggies while you are crisping the skin on the chicken. Here’s a grill full of deliciousness! 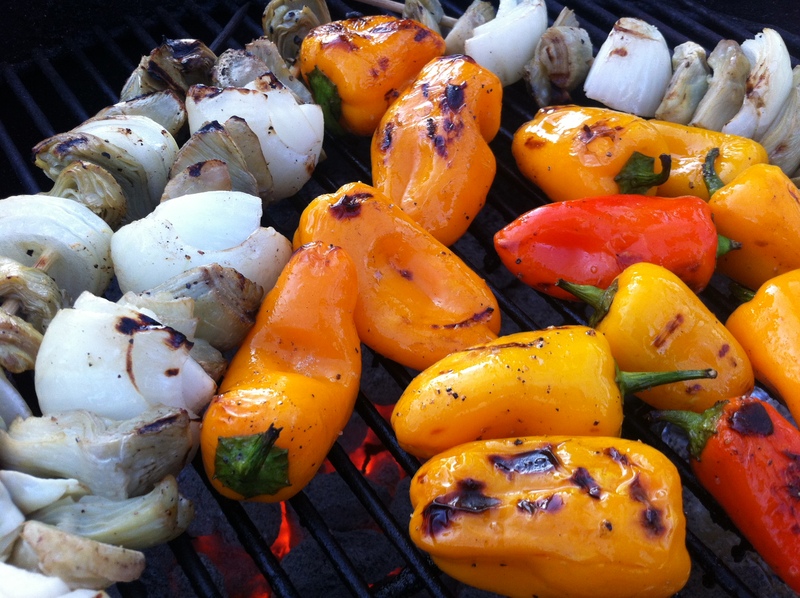 Place the veggies on the side of the grill over the water pan and cover for about ten minutes. The veggies will get warm and a little softer without getting burned on the outside. Remove the cover and place the veggies over the hot coals for a few minutes on each side, just to get a little char around the outside. Remove the veggies and place them onto a platter. You can serve everything family style but I like to create a plate for each person. Serve the chicken and veggies with a nice salad topped with this vinaigrette: 2 tsp. fresh lemon juice, 2 tsp. of the garlic vinaigrette that was used for the marinade, 2 tbsp. extra virgin olive oil and salt and pepper to taste. 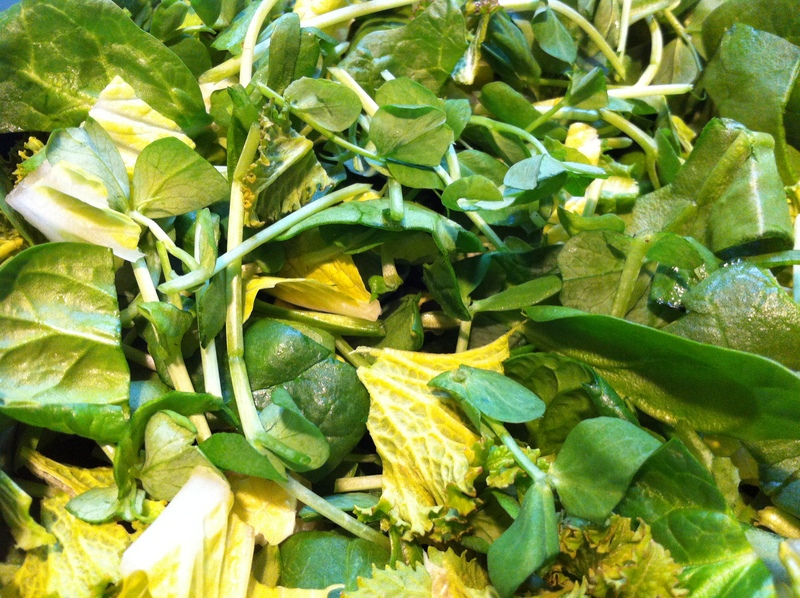 My salad included baby spinach, baby pea tendrils, mustard greens, and shredded romaine lettuce. 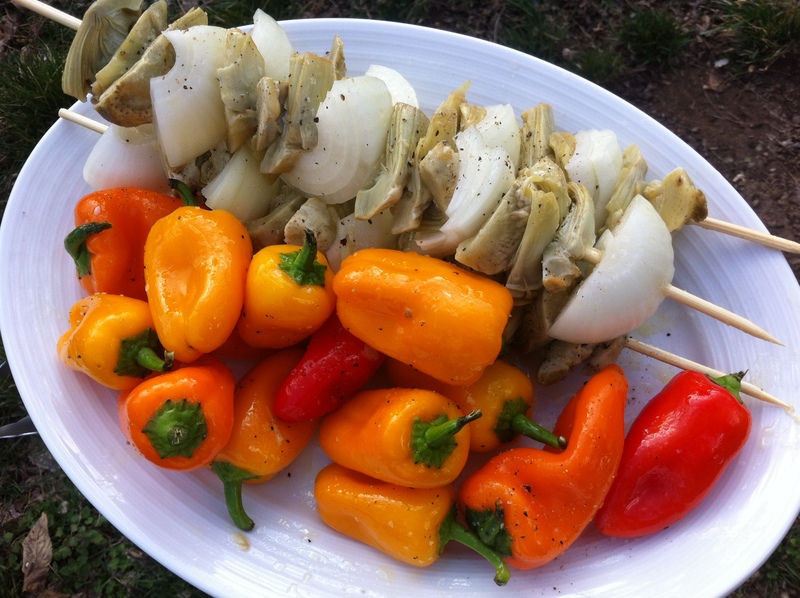 I like to make a little extra dressing and toss the artichokes in it because they can get a little dry on the grill. Pile everything onto your plate and enjoy. The colors really look lovely together, don’t you think? A perfect grilled dinner on a beautiful day! We paired this dinner with a cool Nugget Nectar from Troegs Brewing Company and ate out on the back deck, here’s to an early start to spring! P.S – Check out what I’m doing with the left overs in my next post!